Two years ago, my son decided to have an Elvis-themed birthday party. As random as that sounds, it turned out to be a super cute theme and it was SO MUCH FUN. It was a family party and we all really got in the spirit. We've also done several movie nights with Elvis movies. So, we have some Elvis "stuff" on hand. 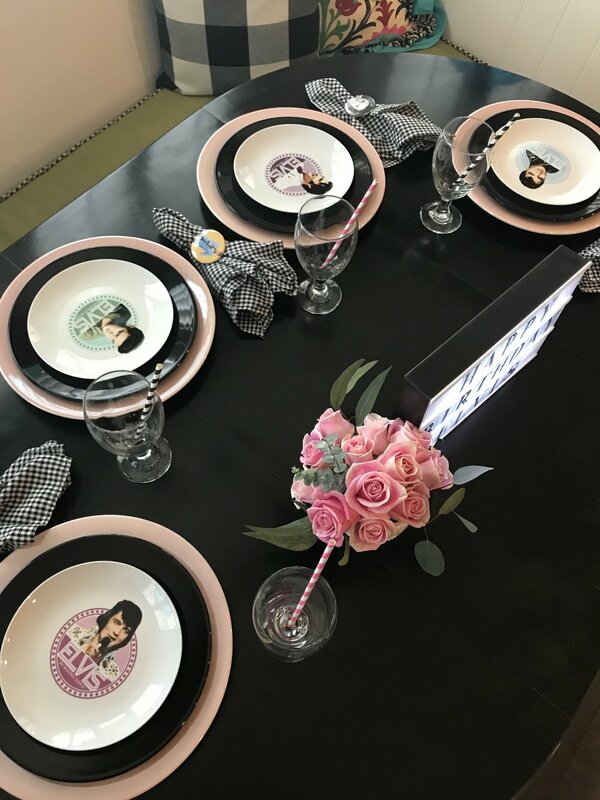 Yesterday was the start of the kids' first full week back to school, so it was a perfect night to surprise them with a little themed dinner in honor of the king of rock 'n roll. Fun fact... Elvis died just a few weeks before I was born. My mom said it made her so sad thinking her baby would never know who Elvis Presley was... little did she know! I had the little plates from a movie night. I pulled it together with pink chargers, black plates and gingham napkins. We had some Elvis buttons left over from the party, so I used those on the napkins. Elvis ornaments hung from the chandelier and we listened to Elvis Radio on Pandora. The menu was of course... the famous Elvis sandwich: fried peanut butter and banana. A quick Pinterest search showed that many people include bacon. So obviously we added bacon. I'm here to report they were delicious! I'm all about finding random things to celebrate and get things all shook up, if you will. (Ha) See also... Groundhog Day, Texas Independence Day, Cinco de Mayo... you get the idea. Adding a little fun to the mix is always the cure for an otherwise boring Monday!